Disabled Londoners are more likely to experience poverty and inequality than people who are not disabled. They are less likely to be in work, less likely to have higher qualifications and are more likely to be low paid, even when they do have good qualifications. Poverty is compounded by the higher costs of living with a disability. London’s Poverty Profile (LPP) finds that 1 in 3 families with a Disabled adult are living in poverty, compared to 1 in 4 families without a Disabled adult. In addition, research by the Equality and Human Rights Commission has found that 18% of Disabled people aged 16-64 are living in food poverty, compared to 7.5% of the population. The proportion of Disabled people with no qualifications is significantly higher than among the non-disabled population in London. LPP finds that 70% of students with special educational needs (SEN) in London lack Cs or above in their GCSE English and Maths. A report by the Social Market Foundation, funded by Trust for London, found that while overall employment in London is 85%, the employment rate for Disabled people in London is 46.5%. Around 400,000 Disabled Londoners are unemployed, and in some boroughs, only a quarter of Disabled people are working. People with mental health problems, who make up almost a third of all Disabled people in London, are most likely to be unemployed. Other research estimates that less than 10% of people with learning disabilities in the UK are in paid employment. We have funded a number of projects to address the issues faced by Disabled People. Most recently, we have launched the Strengthening Voices, Realising Rights Initiative. The Initiative aims to bolster the capacity of Deaf and Disabled people’s organisations (DDPOs) to offer advice and casework so that Deaf and Disabled individuals experiencing poverty and unmet care needs obtain help to lead dignified, good quality lives included in the community. Trust for London and City Bridge Trust are currently funding this initiative. Trust for London has a long history of funding work in communities to tackle poverty and inequality affecting Deaf and Disabled people as well as publications and research examining the issues facing Disabled Londoners. 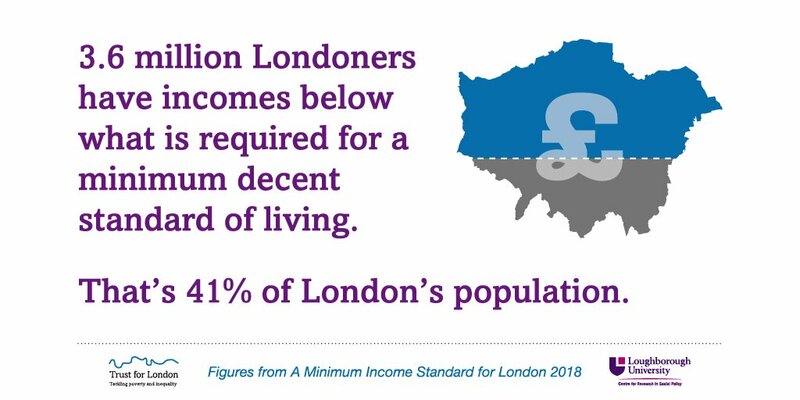 You can read more information about our research about Disabled Londoners by looking at London’s Poverty Profile, and at the publications below.